When is a vegetable cooked properly? Should it retain some crunch, or be cooked to melting tenderness? Tom and I are often at odds on this subject. Venture beyond root vegetables and harmony flies out the window. Tom generally prefers all his veg mushy soft. I like my asparagus, broccoli and green beans crisp-tender — and still bright green; no olive drab for me, thank you very much. Y’all know about caramelization. That’s what happens here. Those chocolatey bits are sweet and slightly smoky, and the zucchini takes on a creamy texture. You could slice or rough-chop the zucchini (and I do sometimes), but I like how the stiff squash batons soften and curl around each other. The lovely green pepitas* provide a crunchy contrast. As usual, I couldn’t resist adding a minced Fresno chile; the red flecks are so pretty against the green. *Pepitas are sunflower seeds. Buy them without their shells; I find mine in the Mexican section of my local grocery store. Trim the ends off the zucchini. Stand one zucchini on an end and slice vertically. You’re aiming for a long piece with all the skin and roughly an inch or less of flesh. 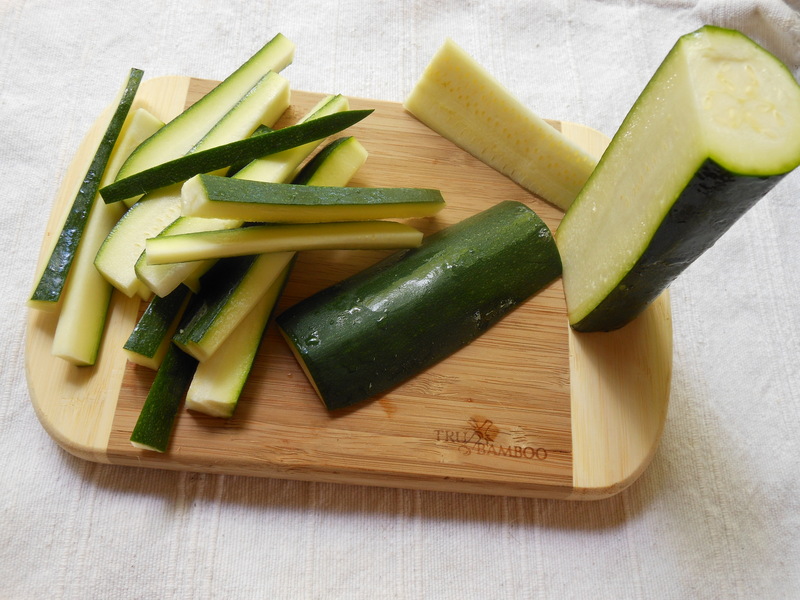 Continue slicing around the zucchini until you have long, thin strips and there’s a seedy core left over. Discard the core and slice the rest into 1/2-inch thick sticks 3 to 4 inches long. (This is a great way to use those baseball-bat-sized zucchini.) Or you can just slice them into rounds, if the sticks are too fussy for you. Warm 1 tsp. of the oil in a large skillet over medium heat. Add the pepitas and toast for a few minutes, until they are lightly toasted. Tip them into a bowl and set them aside for now. Add the remaining tbs. oil to the pan along with the garlic, shallots, and chile (if using). Cook over medium heat for a few minutes to soften the shallots and mellow the garlic. Add the zucchini sticks, raise the heat to high (or medium-high, if you have a super-hot burner) and season with salt and pepper. Sauté, stirring now and then, for about 10 minutes, until the zukes are tender and show some serious browning. Add the toasted pepitas, cook 1 minute longer, and serve hot. 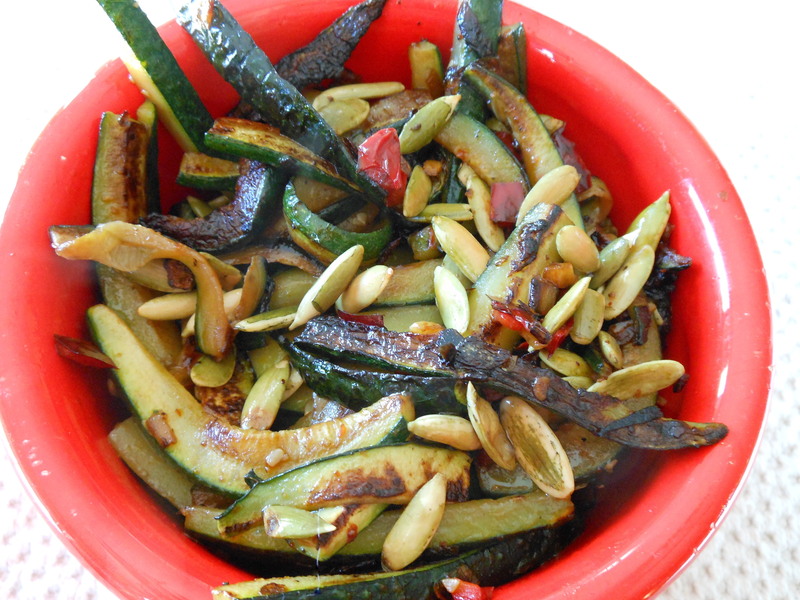 This entry was posted in sides, veggies and tagged healthy, pepitas, pumpkin seeds, side dishes, squash, vegan, vegetarian, zucchini. Bookmark the permalink. 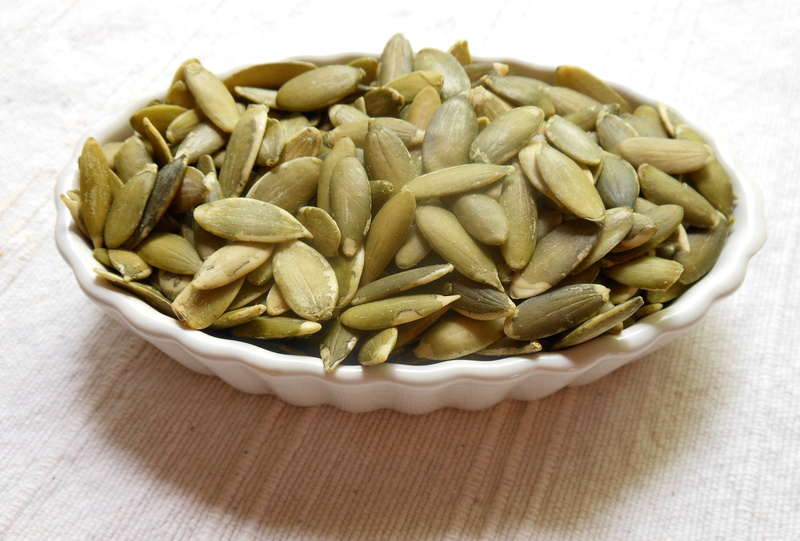 Actually, pepitas are the edible part of pumpkin seeds. Never used them in that way, but sounds good.